Blazing Fast 7.2:1 Gear Ratio – The KastKing Speed Demon is the fastest gear ratio spinning fishing reel in the world at 7.2:1! This super high-speed retrieve supports burning lures across the water and quick follow up casts. You’ll catch up quickly with fish that may make a run directly at the angler and eliminate slack in your line. Save time in between casts. During an average day of fishing it’s possible to make up to 16% more casts which can result in more fish being caught. Light Weight Yet Super Strong– Not only is this new KastKing Reel the fastest in the industry, it’s also one of the strongest fishing reels anywhere. KastKing uses extremely strong but incredibly lightweight aluminum for the frame which reduces frame twisting and improves strength. To keep the overall weight as low as possible, the Speed Demon Spinning Reel is equipped with carbon fiber rotor and handle. Powerful Carbon Drag – KastKing Speed Demon Spinning Reels feature stainless steel main shaft and brass pinion gears for strength, durability and consistent performance for freshwater or saltwater fishing. The ultra smooth drag is constructed using three carbon disc layers providing up to 25 LBs/11.34KG of fish stopping performance. While the drag is very strong when conditions call for strength, it has a very smooth start up to protect light fishing lines when conditions require stealth. Demon-Eye Braid Ready Spool – The CNC Aluminum, braid-ready spool eliminates the use of a monofilament line as backing before filling the reel with braided fishing line. It is a perfect match for your KastKing fishing rod and reel combos. Super Smooth and Loaded with Technology –Light, strong and blazing fast certainly describes the new KastKing Speed Demon Spinning Reel. But that is not the entire story! These KastKing spinning reels set a new standard in smooth, consistent performance as well. KastKing used 10+1 double shielded, stainless-steel ball bearings throughout the reel to give you unmatched performance and a silky-smooth operation for bass fishing, saltwater surf fishing, kayak fishing, or ice fishing. The New KastKing Speed Demon spinning reel was made for high speed, consistent, and smooth operation. 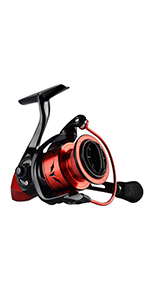 This is the fastest gear ratio spinning reel available today! It will turn the odds in your favor when facing tough conditions that require quick follow up casts whether in fishing tournaments or recreational fishing. 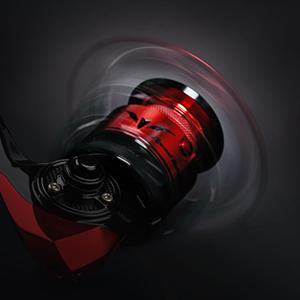 The KastKing Speed Demon Spinning Reel is designed for competition and engineered for the win! The Speed Demon spinning fishing reel has a 7.2:1 gear ratio and features stainless steel main shaft and brass pinion gear for consistent performance under demanding conditions. 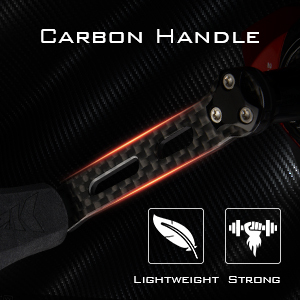 The frame is made of high-strength aluminum to reduce frame twisting under the pressure of heavy fish and features industrial strength carbon rotor and handle to reduce weight. When it comes to smooth, fishing stopping power, you’ll love the triple carbon disc drag that eliminates frustrating and inconsistent drag tension that can result in lost fish. A maximum drag power of 25 LBs/11.34KG, keeps you in control of even the largest fish. The two-tone, CNC aluminum spool is “braid-ready” and eliminates the need to add mono backing onto the spool prior to filling your new reel with your favorite KastPro braid fishing line. This braid-ready feature eliminates braided line from slipping or turning on the spool which reduces the effectiveness of any spinning reel. To be sure your Speed Demon fishing reel delivers a lifetime of consistent performance, KastKing uses only double shielded, stainless-steel ball bearings throughout the reel. A total of 10 bearings plus the instant anti-reverse are perfectly positioned to ensure incredibly smooth operation. This reel will deliver performance on every level and the speed that other spinning fishing reels cannot match. KastKing is an ICAST award-winning manufacturer. This baby looks badass! Paired with a kastking Royale, it looks phenomenal! If this works as good as it looks, I'm going to kill em! First off I just wanna say that this is a good reel. But not for almost $100. Yes it’s smooth, but it’s also heavy and bulky. This is by far the heaviest spinning reel I own. Other companies are making spinning reels that are just as good for half the price. The Pflueger President for example, is lighter, just as smooth, just as durable and feels very well made and it can be found for $50. Like I said this is a good reel, but for $100 I would highly recommend looking into something a little cheaper. If you’re in this price range just scrape together a few more bucks and look into the Diawa Tatula or if you want cheaper the Pflueger President will handle just as good, if not better than the speed demon. No complaints about KastKing at all. Light weight, fastest spinning reel i have ever owned. Brings the fish in quicker. The color and design right out of the box really makes this look as good as it works. KastKing is my new go to fishing company. It's not expensive at all...$90 bucks!!! It's very smooth casting and retrieving. It literally yanks the fish out of the water 30 yards away!! 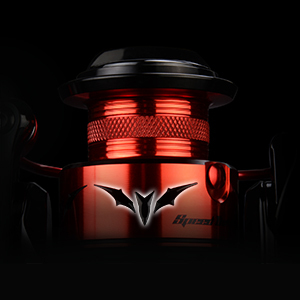 I'm ordering another speed DEMON spinning reel this week. It's no lie. This thing burns all my other reels and not by a little. Most of the fishing I do is salt water so I throw a lot of shrimp, bucktail jigs, the occasional D.O.A., and it runs a spoon beautifully. Mile long casts and effortless retrieves. I would recommend this reel to everyone looking for a solid reel that won't break the bank. Running this on a 7' Penn Squadron II with 15# powerpro braid and 20# fluro leader. The angle of the photos makes it difficult to tell if there's an anti-reverse switch on it. Is there a switch?